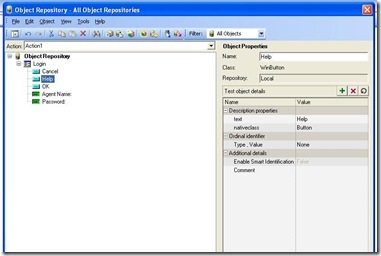 When a new test is created in QTP, it will be associated with an object repository and this is named as per-action / local object repository. This OR cannot be referred in the other tests / actions. 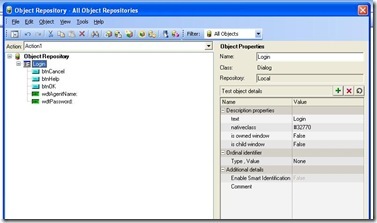 We will try to create an object repository and use in a test script. 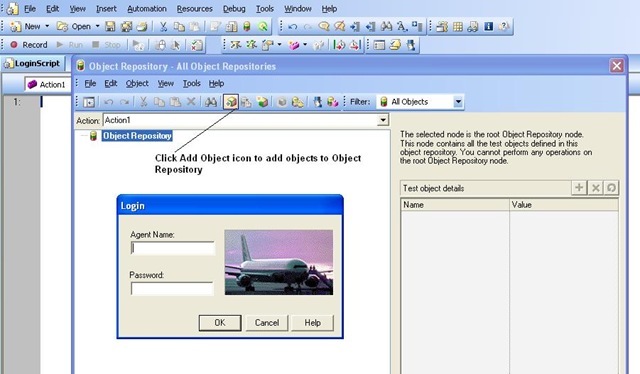 Change the logical names of each of the objects so that identifying the objects inside the script should be easier. 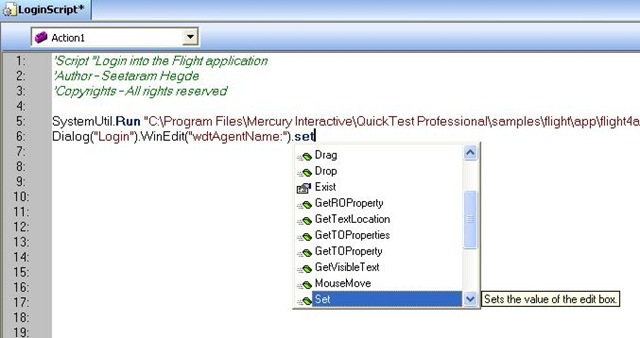 If we use naming convention such as wdt (WinEdit), btn (Button) it will be very much useful when there are a lot of objects to be captured in the Application Under Test. 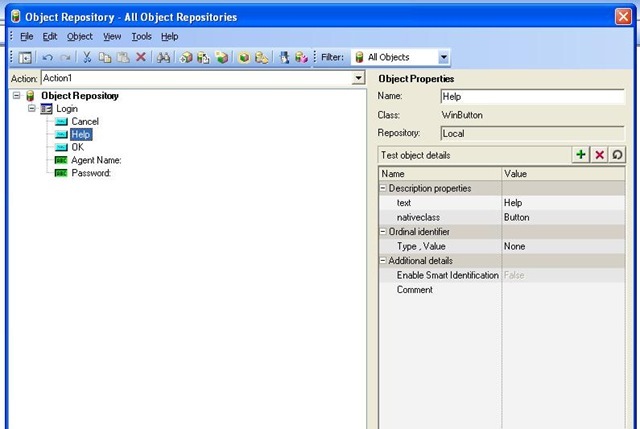 Below is the picture of updated Object Repository. 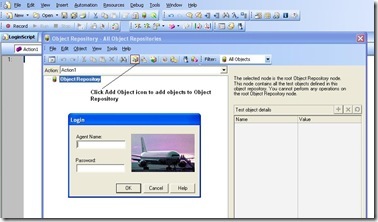 Let us try to create a LoginScript using this newly created Object Repository. 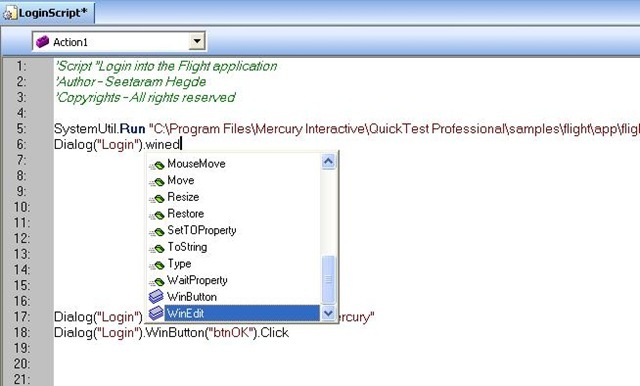 SystemUtil.Run "C:\Program Files\Mercury Interactive\QuickTest Professional\samples\flight\app\flight4a.exe","","C:\Program Files\Mercury Interactive\QuickTest Professional\samples\flight\app\","open"
The above script is not a recorded script but is written. So, follow the below steps to create the script. 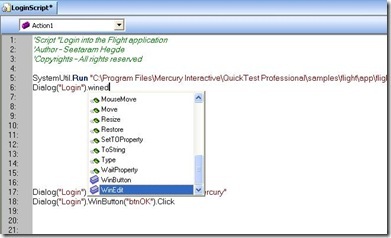 SystemUtil.Run "file name", "directory of the application", "mode"
Type the “Dialog(“ then we can see the names of the dialog available in the object repository. Since here there is only one dialog, we will get only “Login”. Just select the Login and then type “.” that shows a list of objects available. Select WinEdit from the list. Then again, open the bracket that shows list of available edit boxes. 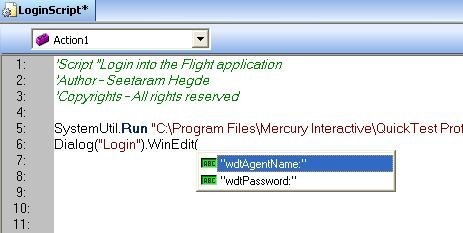 Select wdtAgentName and then again type “.”. 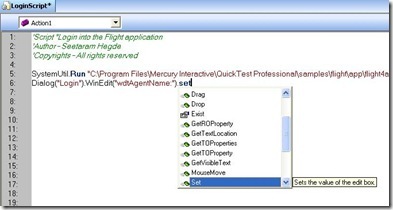 This shows list of methods available to be performed on this object. 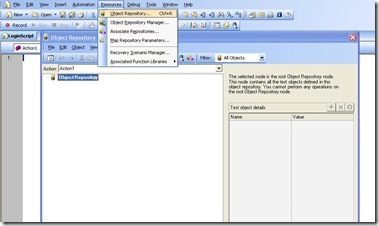 Select “Set” and provide the parameter admin inside the double quotes. This procedure should be followed to the second and third lines also. For the first time, this looks very tedious but after getting used to this, becomes very easy. Repeat this process for other two lines also. I hope this explains well the process of creating a local object repository, adding objects, and using the same to create a test script. We will discuss creation, addition of objects, and usage of Shared Object Repository in the next post. Local / Per-Action OR is specific to a particular test / action. 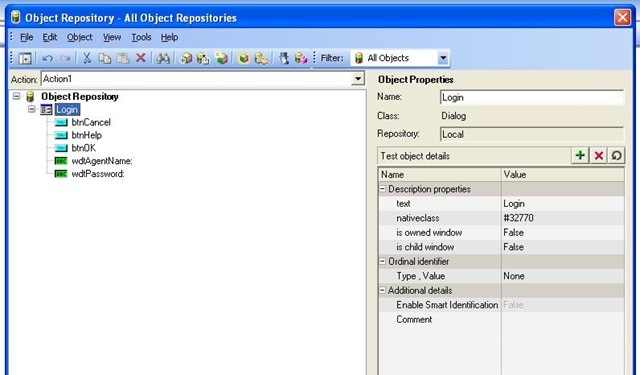 Local Object Repository cannot be reused across all the tests in the automation suite. Hoep u r doing good!! Explanation and examples are really simple and easy to understand. Anyone new to the Topic can easily make out. Keep rocking with new topics. this is what i wanted 🙂 🙂 so happy……….. Please share the path of the local repository also, so that we will get good expo on the same. Thanks for sharing all UFT topics..